“How much baby’s breath do I need?” is a question we hear a lot. This is also a question that is very difficult to answer. 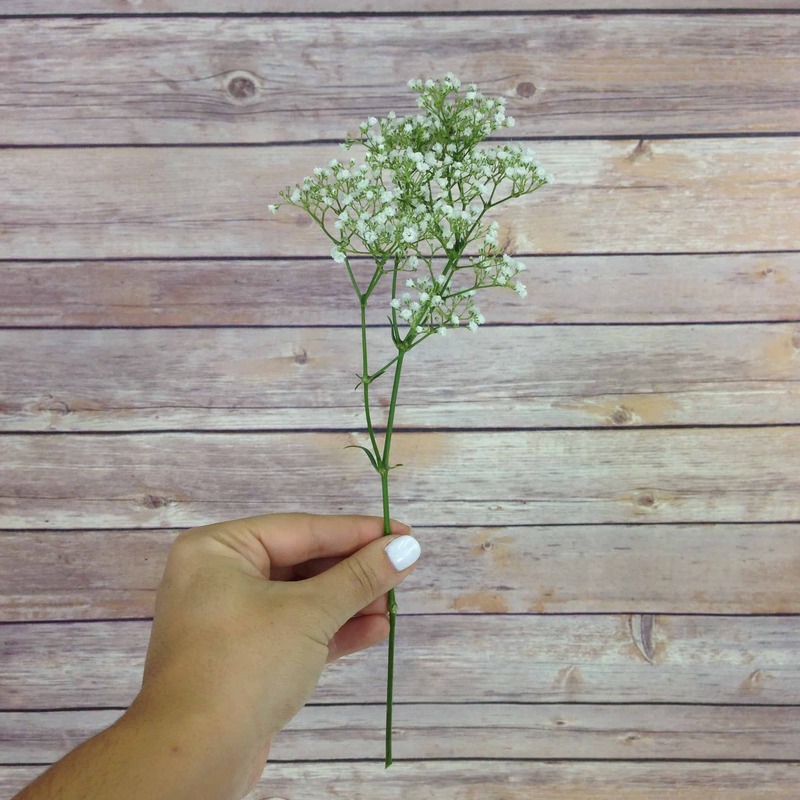 Baby’s breath, also called gypsophila, can be used for so many different kinds of floral arrangements – mason jar centerpieces, pew arrangements, flower crowns, bouquets, bud vases, boutonnieres, etc. It’s a filler that goes a long way. What is in a Bunch of Baby’s Breath? A single bunch contains about 8-13 stems. They are bundled together in grower’s bunches, which means that they are put together by weight rather than by a strict stem count. This is ONE stem of baby’s breath. That’s right… one stem. Each stem will vary in shape and size, but all stems will have multiple smaller pieces branching out. We pruned the stem by cutting off each of the pieces that come off of the main stem. And these are some of the pieces that were cut off from the main stem. Here are all of the pieces that came from just that one stem. And this is what it looks like when all of the smaller pieces from one stem are bunched together. Once the pieces are put together, you can see that a little goes a long way. This will help you decide how much baby’s breath you will need. How Much Does Baby’s Breath Cost? Baby’s breath is a budget-friendly filler because a few stems can go a long way. Most varieties, like gypsophila overtime and gypsophila million star, range from $1.50-$1.90 per stem. Like all flowers, pricing can change with availability at certain times of year, like Valentine’s Day and Mother’s Day. For the best bulk prices, shop our selection here. As you can see, determining quantities for can be a tricky task, but we hope this helped you nail down how much baby’s breath you’ll need! If you have any other questions, leave a comment below or shoot out customer service team an email! This was very helpful as I plan to use baby’s breath for my wedding centerpieces, aisle markers, and boutonnieres. Was wondering how much I need to order and this was helpful to plan the amount. Hard to find these kinds of answers when you’re DIY-ing it! Stephanie, we are so happy to hear that! Feel free to let us know if you have any other questions! how do you make flower crowns or hairbands for little girls (ages 3-7). Hi Marci! You can make a flower crown by using floral wire as the band. You can wire/attach flowers to the crown. I hope this helps! Hi Katherine! For the 6 pails, you will need about 3/4 of a bunch per pail. For the bouquets, you will need about 2-3 stems per bouquet and depending on how large the centerpieces are you will probably need anywhere from 3-6 stems per centerpiece. In total, I would recommend roughly 10-12 bunches of baby’s breath. Wow, this is extremely helpful! We’re trying to save as much money as possible for our wedding, and flowers is a place we’re struggling. Planning to order in bulk, and this helped a lot to know how much we need! Thank you! We are so happy to hear that! Contact us if you have further questions. SOOOO VERY HELPFUL! Thank you! I’ve looked everywhere for a simple explanation like this. We are so glad to hear that, Brittany! Feel free to call or email with any other questions. HI!! Love all the great tips! We are going to lining the aisle with galvanized buckets with baby’s breath. How much do you think per bucket for a nice full look? The buckets are about 12″ in diameter. Thanks so much! Awesome! How tall are the buckets? For a nice full look, we would recommend about 2 bunches of baby’s breath for 1 bucket with a 12″ diameter. 1 and a half bunches would still be able to fill a bucket though, it will just be a little more sparse looking. This page exactly what I am looking for, and not waste time and money on babys breath order. Any suggestions on how much babys breath to buy to fill 10—-9 inch tall vases (diameter about size of baseball)…which will have water in them and floating candles—wondering if I gle them to bottom of vase also—thanks so much! For a vase with a 4 inch diameter, I would suggest using 1/2 a bunch (about 4 stems) and breaking them apart into shorter stems to fill the container. Hello Cindy! For a bucket, you can use about 1/2 to one full bunch per bunch depending upon how large of a bucket you use! I hope this helps! Hello, this article is a god send. The information you provided is great! but I still need some advice. I will be purchasing 4 ounce bundles but I’m still not exactly sure how many bundles to purchase. I would like a very full look. I will need to fill 10 eiffel tower vases measuring 27.5″ high with a 2″ square top. Sure! What else can we help you with? I was just wondering if you can help? I was hoping to have a kind of roll of gypsophilia going along the windowsill at the church I’ll be getting married in, but unsure how many stems I’d need. The window is 16ft and I’d like the roll of flowers to be of a good thickness. Hi Joanna! I would say 1 bunch will give you about 3 feet, so I would go with 6 bunches. Great tips! Thank you!! I am confused though by what I’m researching. Some places say order by the stems, and some say order by the bundle…..how do I know the difference? How many stems usually come in a bundle/bunch? I’m trying to get a full look in two different vases (one size: 24″ tall, 10 3/4 diameter and the other 13″ tall and about 8″ diameter) I also want to fill some mason jars too, so I feel somewhat lost with the different terminology….thanks in advance!! Great questions! I can definitely help you out with this, I will send you an email with some more details and you can feel free to ask any further questions! 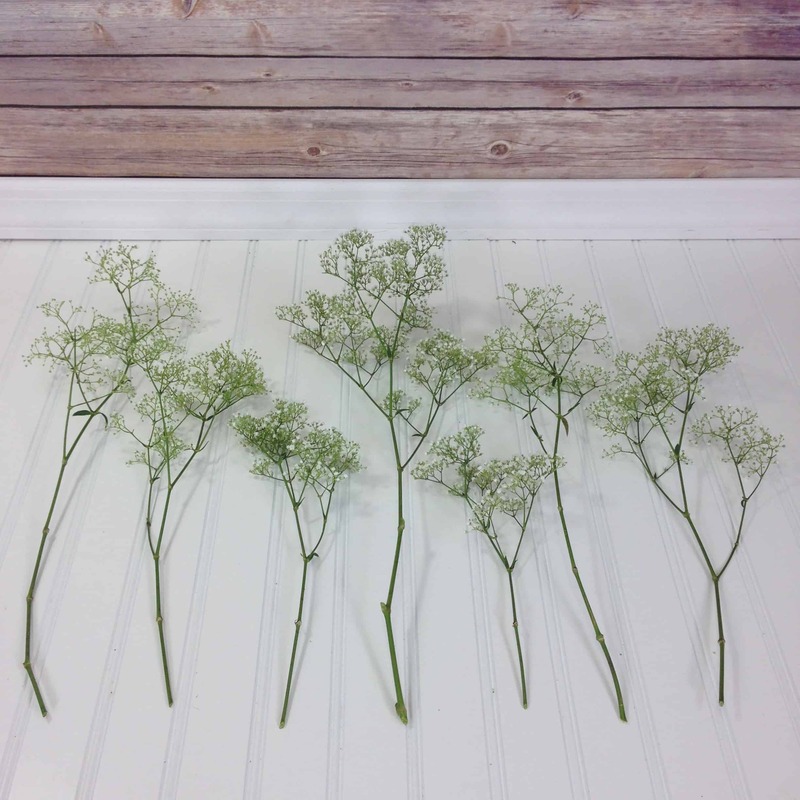 In case you are looking for a quick answer, most of our bunches contain 10 stems. I would love information regarding the difference between bundle/bunch/stems etc. A bunch is normally 10 stems, but the quantity should be specified under the product description. The terms are sometimes used interchangeably. Hi, I am making a baby’s breath garland for a table. Would you recommend the same as you did for Joanna` ~1 bunch equaling about 3 feet? Thanks so much! Hi Wanda! Yes, I would recommend amount. Question… I am going to have mason jars with 4 roses in them and babys breath. How many stems of babys breath should I put in the mason jars with the roses? Also, how many stems will I need to put in my buckets that have a diameter of 7.5″ and 9″ tall? 3-4 stems of baby’s breath in each mason jar will give the arrangement a full look with the roses. For the buckets 7-10 stems will do! My daughter is getting married May 20, 2017. I have 20 – 5.5″ galvanized buckets for the aisle and need to know how much babies breath to order. Please help! Hi Diane, you can use 1 bunch bunch per bucket. You will need at least 18-20 bunches to fill all 20 buckets! Hi, my name is Susan and my wedding is in June! This was very helpful but I still need some help. I want to make sure I get enough babies breath but have been having trouble calculating how much! I am doing babies breath around a small lantern about 4 inches wide on all sides for 17 tables. I want it to look nice but it doesn’t have to be too full. Hi Susan. To make a small wreath-like shape around the lanterns, you can estimate for about 3 stems for each (2 stems will be sufficient, but 3 will give a fuller look). And then for the mason jars, 4-5 stems will be enough. So 11 bunches should give you enough for all of those arrangements! Thank you SO MUCH…we’ve been struggling with “how much do we need.” This page is WONDERFUL! Hi Sarah! Thank you for the kind words!! Thanks a lot!! I was completely lost before I found your blog. Thanks! This is so incredibly helpful! I’m using all baby’s breath for my bridesmaid bouquets (8) flower girl crowns (2) center pieces (38 mason jars) ceremony decorations (8 mason jars) 10 bout. And 3 corsages. Will 200 stems be enough for all this or should I get 300 to be safe? Hi Liz. If you are going for a fuller look for the centerpieces and bridesmaid bouquets, I would say definitely go for 300 stems. Otherwise I would still suggest a little more than 200 stems, 250 stems will give you enough for a more sparse look. I’m sorry I just saw this reply! I’ve changed a few things could you help me get an idea of how much? It will be 8 bridesmaid bouquets, 7 boutonnière’s 35 mason jar center pieces and if I have extra enough the line the aisle of the ceremony. Liz, 200 stems will give you enough for the bridesmaid bouquets, boutonnieres, and mason jars. Sorry I have one more question! I’m getting married on a Friday, the flowers from Costco are getting delivered Wednesday. Wednesday night I’ll put them in water but Thursday we’ll put them all together… So doing the boutonnière’s and bouquets will they survive if not in water or should I keep them in water once they’re put together or put them in a fridge? Thank you! Hello, I have a question I am just using baby’s breath for my wedding and need to know how many bunches I will need. I need to fill 12 , 9″ wide 6″ high buckets, fill 50 mason jars, 2 smaller lanterns, make 3 bouquets and 4 Boutonnière’s, and have a little extra just incase, looking for a full look. Thank you! Using 1 bunch per bucket, approximately ½ a stem per mason jar, ½ a bunch per lantern, 1 and ½ bunches per bouquet, and ½ a bunch for the boutonnieres will give you the full, lush look you seem to be aiming for. All together, we would recommend ordering approximately 21-23 bunches of Baby’s Breath for your arrangements, with a little left over! Hi Marcia. The wax flower has a similar number of branches coming out of the base stem as baby’s breath. Both vary in number. The wax flower branches are more consistent in size and start further up the stem. The major difference is the wax flower normally has less blooms or flowers and more spines or needles, the gyp is just stems and little flowers. Hope that helps! Thank you for this very helpful post it really made my day. I was hoping you could let me know if wax flower stems also have a few smaller branches coming out of them? I am wondering if you can help me out. I’m planning on doing centerpieces with tall vases and just the baby’s breath flowers. The vases would approximately be 20 inches tall. I have 23 tables, so I am unsure how much I would need to fill the vase and how much I would need to order in total. Hi Megda. If the vases have an opening/diameter of 4-6 inches, we would recommend about 7 stems per vase, so 17 bunches will give you enough baby’s breath for all 23 arrangements. Hi Michelle. For the bottles with the roses, one rose and one stem of baby’s breath will be enough. For a fuller look, 3 stems of baby’s breath will give you that. Hi your comments are very useful. However I still need your help. My sister is doing 12 oasis balls (not sure if they will be 3″ or 4″) she will be making them very full with baby’s breath. Could you please tell me how many stems she would need for each ball in both sizes. They are for my sons wedding in June . Hi Rosemary, 7-9 stems of baby’s breath should give you enough for a 3 or 4 inch sphere. Hi Alana, I am also using wine bottles for the babys breath. Do I need to have water in the bottles or will they be ok for about 18 hours without water? Hi Keily! Yes, fill the wine bottles about halfway with water. Cut the stems of the baby’s breath about 1-2 inches and they will remain in great condition for the event! Hello I need to know how many bunches I need to get of baby’s breathe for my wedding. My five bridesmaids will be holding them as their bouquet. My groom and the five groomsmen will have it as their boutineere. Then I will have six buckets with a 10 in diameter, I want these to be full. Then I will have baby’s breathe at 10-15 tables. Then I will have it around the room as well. HELP me please. Thanks! Hi Kat. 5 bunches of baby’s breath will be enough for the bouquets and boutonnieres. For very full bucket arrangements, we would estimate 2-2.5 bunches per, so 15 bunches should cover all 6 buckets. And for the table centerpieces, 6 bunches should cover 10-15 tables. So total this would be 26 bunches of baby’s breath. Tia, 15 stems sounds like a lot for a 4 inch opening. But that will definitely give a very full look. Do you have a color scheme in mind? If you are going for white, I would suggest 5 Eskimo roses per centerpiece. Thankyou so much, that has saved us a lot of worry. A very helpful post, however I just worry I won’t have enough babys breath. I would like some advice. I am wondering how much babys breath I would need for 6 small bouquets? I am also wondering what you recommend for centerpieces, I would need 30 centerpieces and the vases are 7in tall and 3in diameter. Thanks for your help! Sarah, for small sized bouquets, less than 1 bunch of baby’s breath is needed for each. So I would suggest 5 bunches for 6 bouquets. 4-5 stems will be sufficient for each centerpiece, so about 13 bunches will be enough for the centerpieces. That makes about 18 bunches for all arrangements. I would like to use Babys Breathe in my mason jar center pieces. How many stems will I need for 35 twelve oz jars? Thanks! Rayona, 6 stems per jar will be more than enough. So about 200 stems. Hi, Was wondering if you could help me determine how many bunches of baby breath I need to order? I have 10 buckets that measure 10 inch across and 8.5 inches tall that will have nothing but babys breath. Then have 32 mason jars that are 4 inch tall and 2 inch wide at the top. then going to use some sparingly in other areas. How many bunches should i get? Brooke, for the buckets you will need almost 2 bunches per. And for the mason jars, about 3 stems will be sufficient. So total that would be about 30 bunches. Hi, I am making 6 X tall 24″ arrangements with baby’s breath using trumpet vases, 4 short hurricane vases with 8 1/2 rings around them, 10 bridesmaid bouquets, 1 bridal bouquet 8 boutonnieres and 3 corsages , I want them to be really full and to look like big puffs with full stems all around, How much stems should I order? Shanitra, for very full arrangements in the trumpet vases you will need 2.5-3 bunches each. For the bridesmaid bouquet, 1-1.5 bunches each and for the bridal bouquet 2-2.5 bunches. 1 bunch will cover the remaining corsages and boutonnieres. So total that would be around 300 stems. But 350 stems would be best for very full arrangements. Hi there! My daughter is making her own bouquets using baby’s breath and sola flowers. Do you have any advice on drying baby’s breath for these bouquets and centerpieces? She is using the baby’s breath as fillers for her bouquets, five bridesmaids bouquets, five boutonniers, one wrist corsage and mason jar centerpieces for five tables (with other flowers, too). She is also using the dried baby’s breath in burlap cone-shaped holders for the end of the pews in the little church which are probably about one dozen. Thank you. Mary, the best way to dry baby’s breath is just to leave it out without water. I wouldn’t leave it outside, but it will speed up the drying process if they are in heat or sunlight. I would also cut and bunch the stems to the length you need for the arrangements before drying, because once the baby’s breath is dry, it will shed very easily when touched and played with. We would also recommend ordering a few weeks prior so they can really dry out. Hi, I love Baby’s Breath and am using a lot of it for the wedding. I’m wondering about how much I would need to incorporate to my hair, which is half way down my back and will be half up half down. We’re also hoping to line the aisles with baby’s breath, not in buckets, but just the tops laying on the floor. Can you give me an idea of how much we’d need for an aisle that is 53 feet long, if we want to line both sides, all the way down. Rachel, for your hair you won’t need more than 5 stems. For the aisle, it sounds like you will need about 3 stems per foot (to give a sparse look). So that would be a little over 300 stems. So we would suggest 30-35 bunches of baby’s breath. this has been so incredibly helpful in trying to plan out the amount of babys breath I will need. I have been able to figure out the majority of the numbers from reading the blog. Except for on thing, I am having 5in diameter 11in tall buckets fopr the aisle, how many stems should go into each for a full look? Aja, we are so glad to hear that. 7-9 stems per bucket will give a full look. Hi! I am looking at using baby’s breath for 20 mason jars in a center piece and also need baby’s breath for 8 bouquets of just baby’s breath. How many bunches would I need? Rae, you will need about 10 bunches. Sharon, 2-3 bunches will be enough. Thank you for providing such great information! I didn’t see anything about how far in advance you can do baby’s breath bouquets. I’m doing my daughter’s wedding cake, so won’t have much time right before the wedding, but would love to be able to do the bouquets ourselves. Unbelievable the prices for them with a florist!! I’m sure they are worth it, but we don’t have it. Diane, the bouquets are easy and the baby’s breath is hardy. We would definitely recommend doing them yourself. You can probably make the bouquets up to 4 or 5 days in advance. Just leave them hydrating in water without the ribbon or bouquet wrap, and make sure to change the water when it gets cloudy, and trim the stems if necessary. Hey awesome post! I am using 12 pint-size mason jars for my wedding and putting baby’s breath and a floating candle in each one – wouldn1 bunch be enough to order? Thanks Nikki! 1 bunch will be enough for a sparse look, for a more full look we would suggest 2 bunches. Wow, you are so wonderful to give everyone individualized answers. Will 100 stems be enough? Martha, I am not sure of the size of the coffee urns, but I estimated for a small table top size with 5 stems per. If they are large urns, we would recommend another few bunches. 100 stems is the perfect amount for those arrangements otherwise! Hi. I am looking to fill 24 lanterns with a 4″ opening with a bouquet of babys breath? How many stems would I need for each lantern? Shilo, for a full look, 6 stems per lantern. Hi there I am preparing for my nieces wedding Eifel Tower centerpieces (10) Bridesmaid Bouquet (5) Boutonniere ( 7 ) Of course I am going for a full look. I estimated I would need at least 120 stems. 35 stems for bridesmaid bouquet, 70 for centerpieces the remaining 15 should cover the boutonnieres and maybe a few extra for whatever. does that make sense ? Donna, I would recommend 150 stems, to make sure you can completely cover the foam balls. We recommend hydrating the flowers ASAP after they are delivered, then let them hydrate over night. Before you are about to make the centerpieces you can drop the foam balls in water and they will soak through. Then you can begin arranging. I tried looking through all of these questions, but I didn’t see mine asked. This wedding i am helping with will have multiple sized containers of baby’s breath only. Do I put the processed baby’s breath arrangements in water on the tables, or do I just place it in empty containers? Thanks! Lisa, if you want the baby’s breath to stay fresh and avoid shedding, put them in water. Otherwise they will start to dry out and there is potential for shedding a light browning. Super helpful blog! I placed an order with you 2 days ago and since this is my first time and it’s my daughter’s wedding, I am a bit scared that the flowers will arrive in bad shape. Read some of your reviews and you did receive more good/great reviews compared to other site, However still apprehensive. I have to make 1 bridal bouquet 10 boutonnières, 10 aisle babies breath bouquets. I ordered 25 Roses Akito white, 8 bunches babies breath, 1 bunch of dried lavender and 3 bunches of leather leaf ferns. I still need to buy white spray roses for bridal bouquet and rose petals for the aisle. My plan is to use the spray roses to make the boutonnières and would like to use whatever is left over to spread around in mason jars wherever a floral touch is needed. Do you think I ordered enough babies breath for bouquet, boutonnières and aisle? Also the bouquet needs to be a creamy white, not bright white. Did I order the right color rose? My daughter’s dress is ivory. Your help is really appreciated. Adria, the flowers will arrive needing to be rehydrated. Once you cut the stems and get the flowers in water, they will perk up nicely. If any flowers are in bad condition, take photos and we will be glad to reship or refund depending on their condition. You have enough baby’s breath for your arrangements and aisle. The rose akito is in between a white and ivory, the inner petals are more of a cream color. Hi: I have been waiting for a reply to some of my questions/concerns. Now I have another question. I ordered dried lavender. I wanted to incorporate a little in my daughter’s bouquet and also for the flower girl’s basket. Is the lavender to dry or brittle to use in her bouquet ? Can it be used in the boutonnieres? Adria, the dried lavender is very delicate. It can still be used in bouquets and boutonnieres, just be careful and don’t shake it too much. Lusa, 5 bunches will be enough for all your arrangements. Each bunch comes with 8-10 stems. Megan, for all of your arrangements you will need 18-19 bunches of baby’s breath. This allows for 5 stems each in the mason jars. If you want more full arrangements, I would go with 20 bunches of 200 stems. I wanted to ask about Baby’s breath Garland. We have two large (over 6 ft) fireplaces that we need to dress in the venue and we were planning to make Baby’s breath garland to drape the front of them. How much Baby’s breath do you think it would take per foot? Doesn’t have to be too full and I was even thinking of making it one sided to save money. How many stems are we looking at? Angelia, I would estimate about 6 stems per foot. So for 2 garlands over 6 feet you will need 7-8 bunches. How much stems of Baby’s breath I need? Sara, are you making 50 boutonnieres, each needing one small piece? If so, I would say you need 22-23 bunches. Otherwise, if it’s one small twig you need, you can get away with 20-21 bunches. How much stems I need? Hi Sara, Roughly 18 bunches – 1 bunch of Baby’s Breath could go so far for boutonnieres, so even if you did away with them entirely, it wouldn’t cut down on the bunch count by much. Hi Danielle, for the Pew Bow & Mason jar Arrangements 14 bunches should be enough. I am using baby’s breath as the decoration for a wedding rehearsal dinner. I have 32- quart size mason jars(wide mouth). I will have 8 jars in each of the 4 reclaimed flower boxes. One flower box on each of the 4 tables. How much baby’s breath will I need to buy. Would I need less if the jars were not the wide mouth size? Hello! 16 or 17 bunches would work. The difference in size between the regular mouth and wide-mouth jars isn’t much, if you use the regular mouth jars, you can get away with 15 bunches. Hi. I am putting baby’s breath inside vases and covering it with water with a floating LED candle on top. How much would I need? The vases are 8″, 10″, and 12″ with a 4″ opening. Each arrangement will have one of each size vase and there will be 8 arrangements. I don’t want it to look stuffed, but I want it to nicely fill the vase. We would recommend using about a half stem to 2/3 of a stem for the 8” and the 10” vases, and a full stem for the 12” vases, so ordering 2-3 bunches will be enough for your 8 arrangements! I need to make 6 bridesmaid bouquets, and about 12 boutonnieres. and still have some left over for tables to have some flowers. any suggestions to how many bunches I would need? Hi Candace! We would recommend using 2/3 of a bunch to 1 bunch per bridesmaid bouquet and 2 stems for the 12 boutonnieres, so you would need 6 or 7 bunches for these arrangements. Depending on how many table you have and much Baby’s Breath you were hoping to use at each table, you may want to order 2 or 3 extra bunches. In all, we would say you could order 8 or 9 bunches to have enough for your arrangements, with a little left over! Looking to fill 12 quart size mason jars and 24 pint size mason jars for table decorations. How much Baby’s Breath would I need? Hi Denise! We would recommend using 1/2 of a bunch per each 12 quart size mason jar. You can use 1/4 of a bunch per each 24 pint size mason jar. In all, you would need about 12 to 13 bunches! It is always a good idea to get a little extra in case you do want a fuller look. Looking to create (for my daughter’s wedding) a baby’s breath garland for the staircase – on the floor of the stairs on one side with candles or lanterns. How much baby’s breath do you think I will need to create the garland? There are 20 steps – straight staircase. Also…how soon can I make it in advance? The wedding is a Saturday afternoon. Hello! I am looking to make my bridesmaids’ bouquets completely out of baby’s breath. I would like for them to have that full, round appearance. How many “bunches” would you suggest for 4 girls? Hi Brittany! Roughly 1 bunch per bouquet would create a full and round bouquet! A total of 4 bunches would be enough for 4 total bouquets. 5 bunches may be necessary if you are looking to create a very full bouquet. YES! thank you I’ve been looking all over trying to figure out how much I will need for my upcoming wedding! This was SO helpful! I am making a floral arch just with gypsophila. Has anyone ever made one before and how many stems of gyp did you use? Hi, Sara! The amount of Baby’s Breath you would need depends on the size of the arch you are using and how much coverage you would like. For thin coverage, I would recommend using 2 stems of Baby’s Breath per foot. For medium/full coverage, I would recommend using 2 rows of stems, and 5-6 stems per foot. For Very full, thin coverage, I would recommend using 3-4 rows of stems, and 7-8 stems per foot. You can attach stems of Baby’s Breath to an arch using floral wire, floral tape, or a floral foam garland, or a combination of the three products! Another question for you – I have 22 fishbowl vases that are 5.5″ (Anchor Hocking) with 4″ openings. I would like a relatively full look with the gyp. How much will I need to make these centerpieces look elegant? Hi Myrna! You can use a whole bunch of Baby’s Breath per each fishbowl. This will give each centerpiece that full and elegant look that you are going for! I’ve got foam L O V E letters and 2 foam heart shapes which I would like to fill with baby’s breath for my daughters wedding at the end of November. The letters / hearts are 12 inches high. Roughly how much baby’s breath would you suggest? Hi Julie! You can use roughly 1 bunch per heart and letter if you plan on creating a full look. You can cut little bits of the blooms to make each stem go further. You will need roughly 7-8 bunches in total! There are so many different types of baby breath and variety/grade. Which would be best to get for a full white bouquet? Hi Cindy! 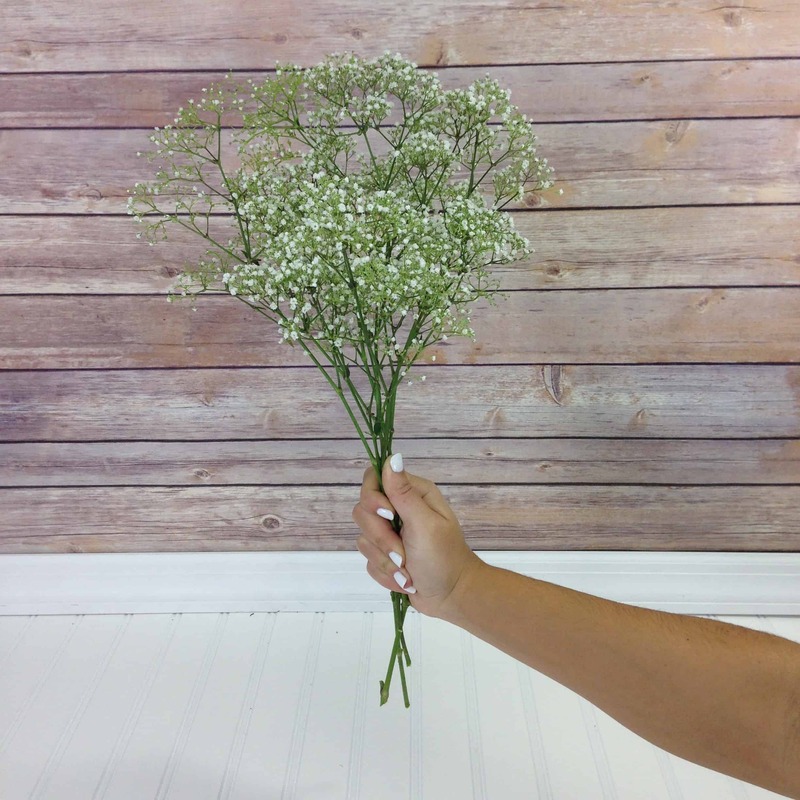 The Overtime variety of Baby’s Breath will give you a nice and full white bouquet! The blooms are a little larger than the million Star variety. You can use approximately 1 bunch for a full looking bouquet! I don’t know who you geniuses are but your site has been incredibly helpful!! I’ve tried to read all the comments but I still can’t figure out how many bunches (I order 20 stem bunches) to buy for my wedding. I have 50 small bud vases I am filling with one hydrangea. I but two or three tiny stems of baby’s breath in the center and side of the hydrangea. So, how many bunches do I buy? Hi Jill! You can use about 3 bunches to fill all 50 bud vases. This will give your bud vases a nice full look with those beautiful hydrangeas! This is awesome! Which type of baby’s breath would you say is the best to work with/looks the fullest? We’re planning our wedding, as well, and I want to make sure we’re getting the best bang for our buck! Hi Tiffany! Both types of baby’s breath are easy to work with and will provide a good amount of fullness per bunch. The overtime variety does have larger blooms and will help to make arrangements more full because of that. You will probably need a smaller amount of baby’s breath if you choose the overtime variety. How much Babies Breath do I need for 5 adult bouquets and 3 small bouquets for little flower girls? Hi Anne! You can use about 3/4 to 1 bunch per each adult bouquet depending upon how full you would like them to be. For the flower girls you can use about 1/2 of a bunch to make a lovely small bouquet. In total, you would need approximately 6 or 7 bunches of baby’s breath! I would love some help! The article has been amazing, but I’d love alittle more help. I will need 5 full bridesmaids bouquets, 13 boxes (8×8) moderately full but not overflowing, and few decor mason jar w/ flowers. How many stems would you suggest? I was thinking 200, but I’m so scared to have less than I need! Thank you! Hi Victoria! For each bridesmaid bouquet, you can use 1 bunch of baby’s breath to create full bouquets. For the 13 boxes, you can use about 1.5 bunches of baby’s breath per arrangement. For the mason jars, if it a quart size use 1/3 to 1/2 a bunch and for a pint or smaller mason jar use about 1/4 of a bunch of baby’s breath! I have been told baby’s breath can have an unpleasant odour. I’m planning on putting a big centrepiece of just baby’s breath on every table in a marquee (15 tables), is the smell something I should be worried about? Hi Chantel! No, you shouldn’t be worried about the odor of the baby’s breath. The fragrance given off by baby’s breath is not very strong. I do not think you will have any issues using baby’s breath in your centerpieces! Hi everyone, what a fantastic blog! I’m doing a friend’s wedding using gysophilia millenia, and just can’t figure out how much to order! I’m making 15 x 10″ balls, and 14 x 18″ balls, how many stems should I use for each sphere? They’re going on top of eiffel tower vases. I always end up ordering too much…any help would be greatly appreciated, thanks so much! Hi Shelby! You can use about 2-3 bunches per each 10″ ball and 3-4 bunches per each 18″ ball. A little bit of baby’s breath goes a very long way! How long does the baby’s breath last. Could i buy 5 days ahead of time and keep them in water till the party? Hi Danae! Baby’s breath does have a vase life of up to 7-10 days. However, we do recommend to receive your baby’s breath two days prior to an event to ensure its optimal freshness. Once you receive the baby’s breath please cut the stems and place them in water to stay hydrated! Thank you- this was so helpful in figuring out how much I needed to make bouquets for my bridesmaids, as well as table decorations! It’s not easy to find this information sometimes! Hi Gracie! Thank you for the kind words! Do you recommend wide mouth or regular mouth mason jar (quart size) for vase for baby’s breath? Hi Leigh! I would recommend to use a wide mouth mason jar when working with baby’s breath if you desire a full look. However, a regular sized mason jar would be a great option as well. You can use approximately 3/4 to 1 full bunch to fill a quart sized mason jar. Hi. I have 30 24″ Effiel tower vases. Would 6 bunches be enough. As well. Can I arrange in vase. Or do I need the floral foam ball ? Hi Jennie! 6-8 bunches of baby’s breath would be plenty for you Eiffel Tower vases. You will need floral foam when arranging these vases. I hope that this helps! Can the floral foam ball be put together on Wednesday if the wedding is on a Saturday? Hi Nichole! You should have your flowers delivered 2 days prior to your event, which would be Thursday. I would recommend to put the floral foam ball together on Friday. Fully soak the foam before adding the flowers. This will ensure that the flowers stay hydrated. Hi there! This has all been SOOO helpful! I’m looking to use baby’s breath only for my center pieces for my September wedding. I have about 15-16 tables with wooden planter boxes. I was thinking sizes of boxes would be either 16(long) x4x4 or 24x4x4. How much would I need? Also, to be sure, each bunch has 10 stems of baby’s breath. And each stem can be cut down to individual stems? Would cutting them down make them appear fuller? Hey, Jess! 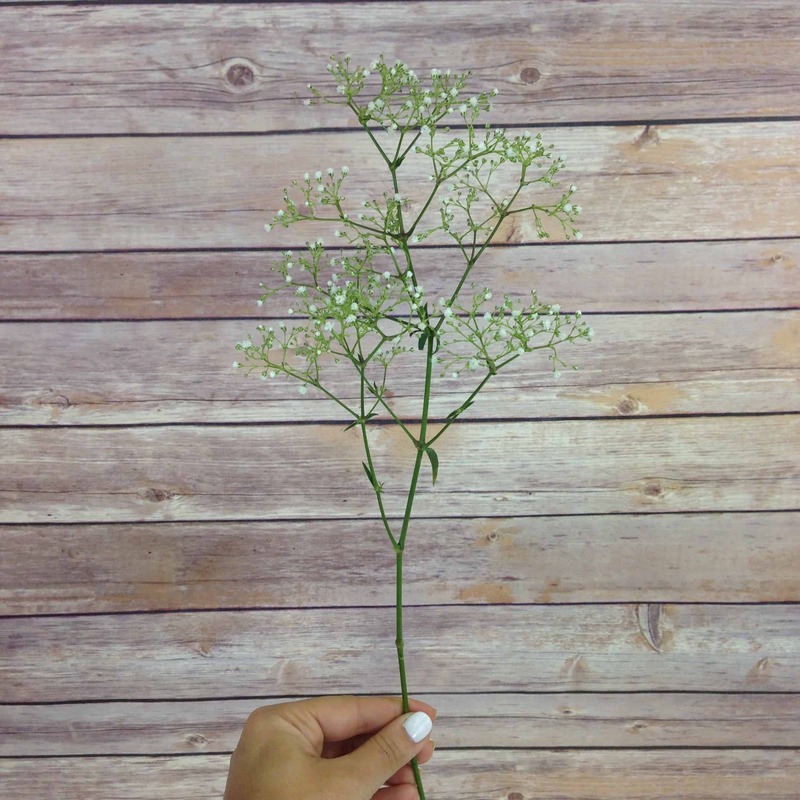 Each bunch of baby’s breath will come with between 8-13 stems, and each one of those stems will have a number of smaller branches. By removing the branches from the main stem, you will have more individual pieces to work with and will be able to make your arrangements look more full and lush! You would need about 1.5-2 bunches per 16″ box, and about 3 bunches per 24″ planter. Email us at service@bloomsbythebox.com if you have any other questions! Hi! Most grateful for all the help here. It seems like there’s a bit of difference between the quantities recommended in the comments vs in the blog itself -I’d calculated my needs based on the blog but then based on responses to comments think I might need more. So would love your help! I’m hoping to fill 35 mason jar centerpieces (a mix of small jars and large – nothing bigger than 32 oz), make a bridal and bridesmaid bouquet, and have enough left over to fill 3 small flower girl baskets. What quantity would you all recommend? This has been so extraordinarily helpful to read about – thank you! Hi Kat! For each 32 oz mason jar, you will need approximately 3/4 to a full bunch of baby’s breath. You will need about 26-27 bunches in total for the mason jars. For the bridal bouquet you will need 1 full bunch as well as 3/4 of a bunch for the bridesmaid’s bouquet, totaling 1 and 3/4 bunches. For the 3 small flower girl baskets you can use about 1/2 of a bunch per basket, totaling 1 1/2 bunches. In total to create all of these arrangements, you will need approximately 31 bunches of baby’s breath. I hope that this helps!! Amazing! Thanks for this response! So that would then be around 300 stems? This is super helpful. I’m wondering if you can help me at all also? I’m not a huge fan of doing huge bouquets for bridesmaids at weddings because they don’t last long and are soooo expensive. My wedding is going to be very laid back and I was looking at doing 8 small baby’s breath bouquets (I get a lot of questioning looks when I say this, but if you look it up on Pinterest, it looks great!) and also using baby’s breath for about 25 table centerpieces that are literally just going to be spray painted wine bottles and beer bottles (meaning I don’t need a ton in each one, just a little something to spruce it up). This probably sounds like a ton of baby’s breath, but any help of yours would be great! I’m at a total loss of where to start right now. How much should I be buying? Hi Shelby! For each small bouquet, you will need about 1/2 a bunch of baby’s breath. So for 8 small bouquets, you would need about 4-5 total bunches. For the 25 small centerpieces, you will need about 1-2 stems per bottle. In total for the centerpieces you will need about 7 bunches. In total you will need 12 bunches of baby’s breath to fill each arrangement! Let us know if you have any other questions! Hello I am making my lovely nieces flowers for her wedding this Summer and wondering how much baby breath I will need for 1 full Bride bouquet 4 not so full bridesmaids 12 button holes. As well as this in church I would like to do one arrangement at top of an arch two at pew level and sparse garlands on end of each pew 24 in all how many would you suggest please and how long before can I make them please. Hi Carol! You can use 1 full bunch of baby’s breath for the bridal bouquet. For the bridesmaid’s bouquet, use 1/2 of a bunch per arrangement, totaling 2 bunches. For the 12 buttonholes you will need approximately 2-4 stems in total. You can break apart the branches of the baby’s breath so that you can use 1 stem for multiple arrangements. I would recommend 2 bunches in total for the arch arrangement depending how full you are looking to create it. Finally, for the sparse looking garlands, you will need about 12 bunches in total. The Total amount of baby’s breath that you’d need should be approximately 18 bunches. The baby’s breath should be delivered two days prior to your event. This will give you enough time to process and prepare the arrangements! I hope that this helps! Hi Natalie! You will need about 10 bunches to cover a 3 meter (almost 10 feet) arch. This amount will give your arch a full look and you can even add other flowers as you see fit. I was wondering what your thoughts are in purchasing baby’s breath for two large wreath’s on the reception venue’s doors. We are planning on doing two large wreath’s with a wooden B in each. Hi Tanya! You will need about 6-8 full bunches per wreath. You will also need about 2 full bunches to fill in the wooden B’s as well. In total, you will need about 20-22 bunches for each wreath and the additional wooden B’s. I hope that this helps! Hi Katy! This is an awesome question! 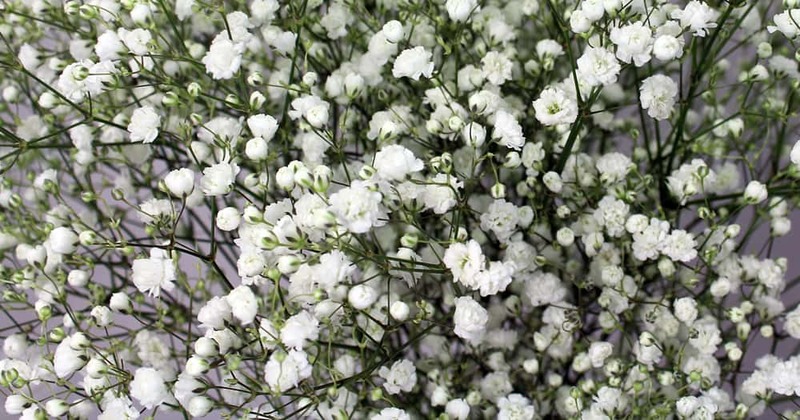 The variety of baby’s breath that is used in this post is called gypsophila million star. I hope that this helps! This could not be more helpful! Thank you! I am doing a wedding with 3 bridesmaids bouquets, 1 bridal bouquet that is mostly hydrangea, 10 boutonnieres, 48 mason jars, two medium vases for registry table and gift table. I am a little confused some places it says multiple stems for a jar some said one. How many bundles or stems will I need for all these items? I am thinking 200 or will I need more?? Thanks so much for your help and this article. Hi, Donna! If you were planning on using only baby’s breath in pint sized mason jars, we would recommend using approximately a third of a bunch per jar. In total, this would work out at approximately 18-22 bunches of baby’s breath for all of your arrangements. For more information, please email us at service@bloomsbythebox.com and we would be happy to give you a more personalized quote! Hi, what a fantastic thread – so helpful! Please could I just check the number of stems / bunches before I order; I’m making 1 bouquet, 7 buttonholes, then adding gyp around the bottom of a single tier cake and to a 3 candle display. Looking for a fairly full look for all. Thanks so much in advance! Hi Michelle! For the Bouquet, you can use 1 full bunch. For the buttonholes, you can use 1 stem. A single stem can be broken up into many pieces, so that a little bit goes a long way! For the cake you can probably use 1 full bunch and about 1/2 a bunch for the candle display. I hope that this helps!! Brilliant, thank you so much Emily! Hi Michelle! Thank you for the kind words!! How many bundles of baby’s breath would I need to make 9 full bridesmaids bouquets? Hi Corinne! If you separate the stems, 5-6 bunches of Baby’s Breath should be more than enough to make 9 full bouquets! How many bunches will I need to make 28 mason jars? I was thinking 10 bunches should be enough but I want to make sure they will be full. Hi Debra! I would recommend to use 1/2-3/4 worth of a bunch per mason jar. A total of 14-16 total bunches would be plenty! Hope this helps! Hi! I’m reading through this after wracking my brain for weeks about this! This is SO helpful. I am doing part of my flowers as baby’s breath. Could you help me calculate and also recommend which baby’s breath to order? I will be doing 36 wine bottles with baby’s breath and I would like it to be full. I am also doing 10 flower buckets to cap the aisles. The buckets are 11 inches tall, with a 6 inch opening. Thank you so much for your advice. Hi Amy! Thank you for the kind words! For each wine bottle, you can use 2-3 stems to achieve that full look you are going for. For the 10 buckets, I would recommend to use 1 full bunch per arrangement. In total, you can use about 10-15 total bunches. The overtime variety would be the best option if you want the fullest look possible! Hi Amy, thank you for the kind words! For each wine bottle, you can use about 2-3 stems. So in total this adds to roughly 72-108 stems. For each bucket, you can use 1 full bunch per arrangement. In total you would need around 12-15 bunches. I would recommend using the gypsophila overtime variety to achieve the fullest look possible! How long should I wait to assemble baby’s breath bridesmaid bouquets? I was thinking of ordering the flowers for delivery on a Wednesday and then assemble them on Thursday for my Saturday wedding? Is this too far ahead or will they be fine kept in water in my cool, dark basement? Thank you!!! This article was SOOOO helpful in determining how much to order. Hi Brittney! I recommend to have the baby’s breath delivered two days prior to your event. You can arrange them the following day to have them ready for your Saturday event. Having them delivered 2 days before your event will ensure that they will be at their freshest for your event! Hope this helps!! I need to fill 44 mason jars for centerpieces, I want them to be full-how many bunches do I need? Hi Karolynn! If you are using a pint-sized mason jar, I would recommend using about 1/2 of a bunch and if you are using a quart-sized jar, you can use about 3/4-1 full bunch! You will need anywhere from 22-30 full bunches. Hi Diane! I would recommend using the Overtime variety! This type of baby’s breath has a the largest blooms of any variety. However, they are not too large! I hope this helps!! We are looking to use baby’s breath as a table runner in our wedding on 14 8ft tables. And in Mason jars lining the isle. How much would you suggest getting ? Hi Sarah! You could probably use about 2 bunches per table and about 5-6 bunches for the aisles. I hope that this helps! I plan on making 17 centerpieces using 17 quart size mason jars. Each jar will contain 6 carnations. How much baby’s breath is recommended to fill out the centerpiece? Hi Cheryl! You can use about 3/4 of a bunch of baby’s breath per mason jar to pair along with the carnations. You will need about 15-16 total bunches of baby’s breath. I hope this helps! I want to say thanks for all the info it’s been helpful. I do have a few questions myself though. First question is what type of baby’s breath is shown here? I’ve seen several different types during research such as million star, Xelence, and Mirabella. I plan to use 14pint size Mason jars and 14 quart size with just bb, and 7pint size that will have 2 carnations each in them, how many stems would you suggest for these. Also I plan to fill the tops of 4 antique milk cans with an appx diameter of 10in, what’s your suggestions for amount of stems for those. I also want to tie some in pew bows for 14 bows? Any help is appreciated, I’m feeling lost with all the different info out there. Hi Danielle! Thank you for the kind words. The baby’s breath that is shown here is the million star variety. For the pint sized mason jars, you can use about 1/2 of a bunch. For the quart sized mason jars, you can use about 3/4-1 full bunch of baby’s breath per jar. For the 7 pint jars with 2 carnations each, you can use about 1/4 bunch of baby’s breath per jar. For the antique milk cans, you can use 3/4 of a bunch as well. For the pew bows, perhaps you can use 2-3 stems per bow. In total you will most likely need around 26-28 total bunches to fill all of your desired arrangements. I hope this helps! Hi Nicolette! For the mason jars, you will need about 1/2 of a bunch of baby’s breath per jar. For each bridesmaid’s bouquet, you can use 1 full bunch per bouquet. As for the boutonnieres, you can use 1-2 sprigs per bout. In total, you will need roughly 30-32 bunches of baby’s breath! I hope this helps! It appears that Baby’s breath is a very popular choice. I am also looking at using Baby’s breath for my wedding which is in April (I am hoping that Baby’s breath is easy to come by in April). First of all, how much do you think I need to order and do you have any other suggestions of cheap flowers I can add to these? When do you think they should be delivered and how do you care for them prior to putting it all together? Would you arrange them all the day before the wedding or earlier? Also how do you make sure what you are ordering is good quality and doesn’t arrive looking straggly? Baby’s breath is available all year long! Another cost-effective option would be fancy carnations. They have a lovely shape! All of your flowers should be delivered two days prior to your event. You can select the exact delivery date that you need at checkout. The flowers are shipped without water. They will arrive looking sleepy and in need of rehydration. As soon as you get your delivery remove the flowers from their boxes and cut their stems about 1-2 inches. Then place those in buckets of water to rehydrate. You will notice that the flowers will perk up and begin to bloom further. After about 24 hours of rehydration, you can begin to arrange them! Hi! I am using baby’s breath in galvanized vases at my wedding and I was curious how much I would need. The vases are 16″ Tall and 8.5″ in diameter. I have 6 vases all together. How many bunches would make them look full and pretty? Thanks so much! Thank you so much!!! I appreciate the reply! Thank you SO VERY MUCH in advanced! So to fill one of those buckets I would recommend using 1 bunch of Baby’s Breath, so you’ll need about 12 bunches. 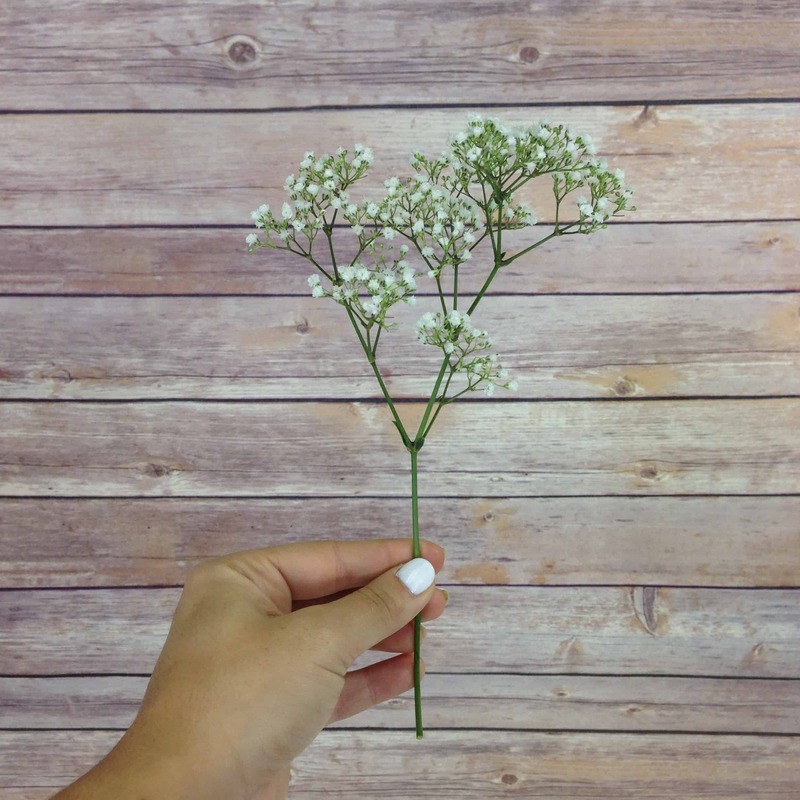 Depending on the sizes and types of flowers being used in those bouquets, you can use anywhere from 3-6 stems of Baby’s Breath as filler per bouquet. I would estimate you’ll need around 2-3 bunches to use as filler. Here is a helpful article about flower quantities! Hi Justine! I would recommend to use about 1/2 a bunch to fill one pint sized mason jar and about 3/4 of a bunch to fill a quart sized mason jar. 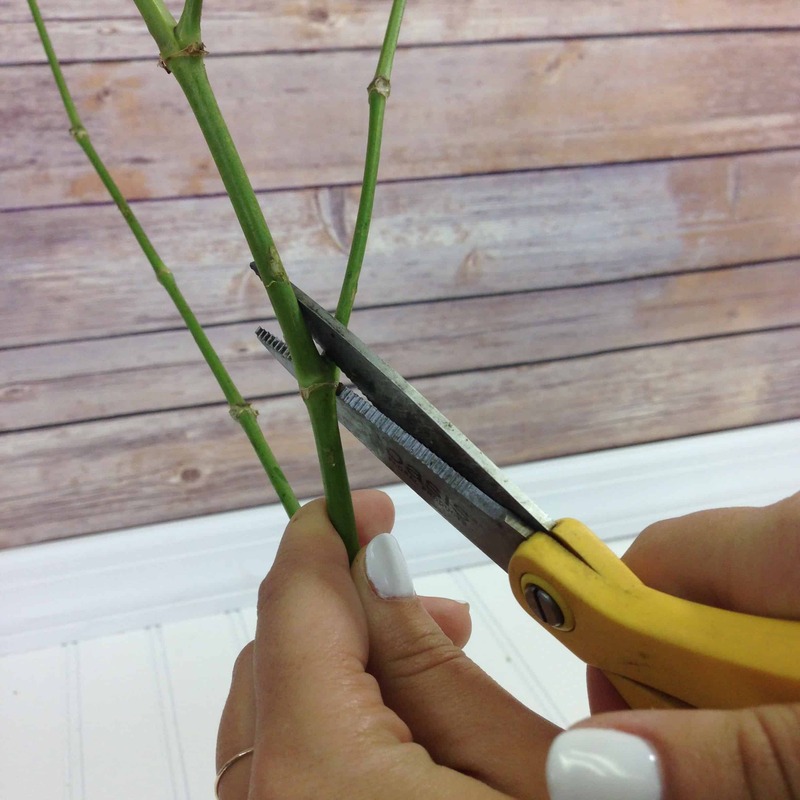 You can cut apart a single stem to create smaller stems to help fill in space as well! I hope this helps! Help! I’ve read through the comments and your post and I’m still confused. I’m trying to narrow down where to buy my baby’s breath and all the bunches/stems talk has my head about ready to explode. I need to fill 24 quart sized mason jars for my ceremony and reception. Any idea what I should order? I’m still confused on what a bunch is through my florist, is that the single bunch with potentially 8-13 stems or is it growers bunch? I feel like I’m over analyzing all the information! Thank you! Hi Karoline! I would recommend about 3/4- 1 full bunch of baby’s breath per each quart sized mason jar. You would need about 22-24 bunches of baby’s breath depending upon how full you want your arrangements to be. I hope this helps! Hi lovely to come across you post, I need to make one bouquet and two bridesmaids flowers. Hi Samantha! For the bridal bouquet, I would recommend 1 full bunch to make a full and large arrangement. For the two bridesmaid’s bouquets you can use about 1/2 of a bunch per bouquet. I would recommend to use the Gypsophila million star variety to use for both your bridal arrangements as well as for the cake. In the 15 jars, you can use about 1/2 a bunch per jar as well. In total you will need around 8 bunches. Help! I am doing 10 small bouquets (bridesmaids) one throw bouquet and one bridal bouquet. I wanted to see how much babys breath to use. We are doing 3 roses per small bouquet and 7 roses in the bridal bouquet. How much should I get?? Hi Breanne! For the bridal bouquet, you can use about 5 stems of baby’s breath, for the bridesmaids bouquets, you can use about 3 stems of baby’s breath per bouquet, and for the throw bouquet, you can use about 3 stems as well. In total you would need roughly 4 bunches of baby’s breath to create all of these arrangements. I hope this helps!! Hello! I am planning to make gypsophila table runners for my reception and I would like them to be lush. I will have 7-9 table rounds and will only use the runner along the middle of the table and not overflowing the sides. Can you help me in determining how much gpysophila I would need to buy to execute this? Thanks! Hi Theresa! I would recommend at least 1 bunch of gypsophila per table. You can break apart the stems to create a runner and it should be quite lush without overflowing on the sides. Hope this helps! How much baby’s breath should I use for 1 bridal bouquet that will also have spray roses and hydrangeas? I just want to accent my bouquet with baby’s breath. Hi Emily! I would suggest about 2-3 total stems of baby’s breath for a bouquet that also has roses and hydrangeas. The baby’s breath will be an accent, so you don’t want to use too much! Hope this helps! So you’ll need about 3 stems (broken down into smaller stems) to fill a mason jar. Filling 25 will require 75 stems or 8 bunches of Baby’s Breath. A bridesmaid bouquet will require around 5 stems of baby’s breath (broken down into smaller stems) and the bridal bouquet will require 8-10 stems (broken down into smaller stems). 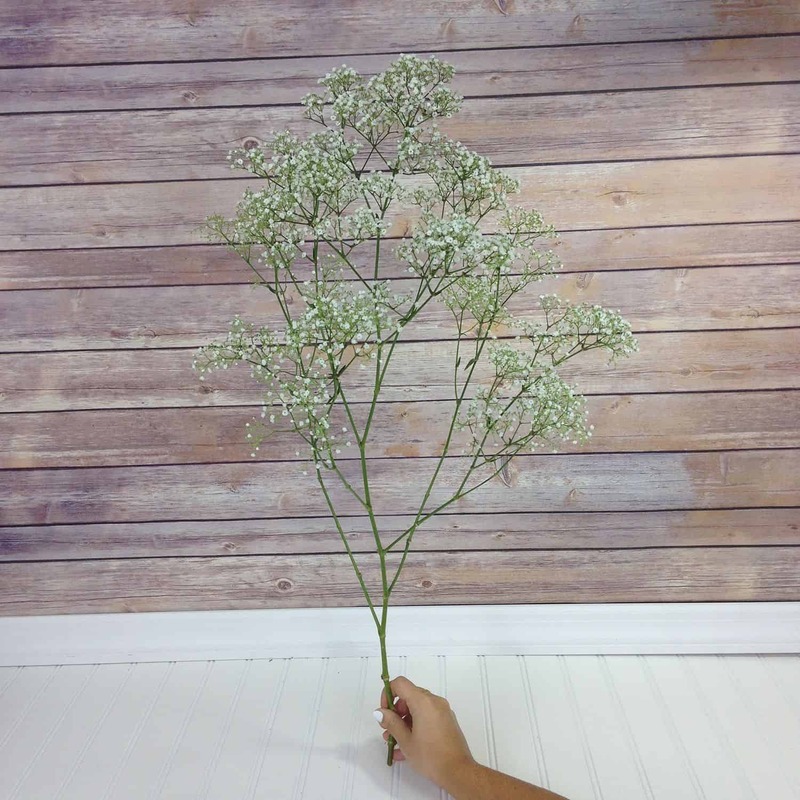 We currently offer 3 different types of Gypsophila, Million Star and Overtime are more or less the same, however the million star has a darker green stem, so there is more contrast. The Gypsophila Xlence has slighlty larger and fluffier blooms. Baby’s Breath can last over a week if you keep it away from direct sunlight and keep the water/containers clean. I would suggest having the Gyp delivered 2 days before the wedding, giving it 4-6 hours to re-hydrate and then working on the arrangements the day before the wedding. Thank you! I didn’t actually realise you sold it too… I just found this blog through a google search! 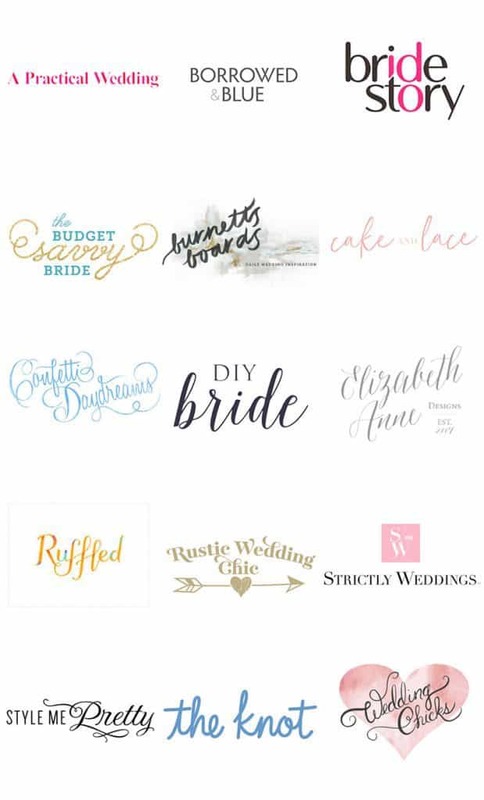 Il have a look now at your gyp, any recommendations of which is best to use for weddings? Hi, how much stems would I need for 33 quart mason jars I plan on having 2 roses in each jar along with the baby’s breath. Hi Myita! You can use about 1/2 a bunch of baby’s breath per mason jar along with the 2 stems of roses. This means you will need a total of about 17 bunches to fill each jar. I hope this helps! How much baby breath do you think at the most I need for 12 Eifil Tower vases, 6 12inch cyclinders with floating candles, 9 bridesmaid med with a few other Flowers’s, Brides large with other flowers, bountierr 12, 6 pew markers with bows. Hi Jackie! For the Tower vases, you can use about 1 bunch per vase. For the 6- 12 inch cylinders, you can use about 3/4 of a bunch per vase. For the 9 bridesmaid’s bouquets, you use about 3 stems per bouquet as you are also including other flowers. For the bridal bouquet, you can use about 4 stems in total. For the 12 pew markers, you can use about 4 stems per pew. I hope this helps! Let us know if you have any other questions! Would half a bunch of babys breath be enough for each bridesmaid? That is all they will have in their bouquets. Hi Renee! Yes, half a bunch of baby’s breath would make nice and full bouquets for each bridesmaid! I hope this helps! I need to make 42 centerpieces. I ordered 42- 16″ eiffel tower vases and foam bouquet holders to go on top to hold the baby’s breath. The foam bouquet holders are 3.5″ wide. How many bunches of baby’s breath do I need to order to have a filled out wispy ball? Hi Molly! Thanks for contacting us!! For each Eiffel Tower vase you would need roughly 1 full bunch to create a nice full look. For the bouquet holder, you can use about 1/2 to 3/4 of a bunch. I hope this helps! Hi! This post is extremely helpful! And I was wanting a little extra just to be safe! Also my wedding is on a Sunday so when should I buy them and have them delivered? And how do I keep them fresh ? Hi Amanda! For each mason jar I would recommend 3/4 of a bunch per jar. For the flower crowns, you would need about 2-3 stems per crown. For the boutonnieres, you can use 1 stem to make all boutonnieres. For the bridesmaid’s bouquets, you can use about 3/4 to 1 full bunch depending how full you’d like to make them. For the bridal bouquet, you can use about 1/2 of a bunch if you wish to add other flowers as well. In total, I would recommend to order a total of 11-12 bunches. This would be plenty to create all of the arrangements listed! For a Sunday wedding, have your flowers delivered on a Friday! This will give you plenty of time to allow the flowers to rehydrate and remain fresh! I hope this helps!! I’m making 16 centerpieces using a wide-mouth pint mason jar incorporating 2-3 stems of roses. How many stems or bunches of baby’s breath do I need to purchase? Thank you. Hi Janet! For each mason jar, you will need about 1/2 a bunch of baby’s breath and then you can put the roses throughout. You will meed about 7-8 bunches of baby’s breath to fill each jar! I hope this helps! Once baby breath is removed from water how long will they stay alive and pretty? Looking at doing center pieces in mason jars for a banquet but need to make them 3 days ahead of time and transport so need to not have them in water. No other flowers in mix only baby’s breath. Hi Rachele! Baby’s breath is quite hardy. If removed from the water, it will remain fresh for about a full day before it begins to dry out. I would recommend keeping the baby’s breath in water for as long as possible. You can fill the mason jars with a small amount of water for easy travel, and then once you get to the event, you can fill the remainder of the jar with more water. I am planning to use baby’s breath in mason jars for a bridal shower. I have to fill 16 (pint or quart) jars for centerpieces. They do not need to be extremely full, we are going for a simple and rustic look with wood incorporated as well. The budget is also limited. Can you help me decide how many bundles/stems I will need to make this look good? Thank you in advance for your help. Hi Emily! For each mason jar, you will need roughly 1/2 a bunch. I would suggest in total for medium fullness, you will need to purchase roughly 7-8 bunches. I hope this helps! For an outdoor wedding, we plan to fill some barrels and nail kegs with baby’s breath at the entrance. How do you ensure that it stays put inside? Do you suggest a bucket with water inserted or some sort of foam? Thank you! Hi Julie! To secure these arrangements, I would recommend sticking wet floral foam in the container you plan on using. Then you can stick the stems of baby’s breath into the foam. They should then stay put! I hope this helps! Oh thank goodness I have found you – please can you help as I am doing my daughters flowers and she just wants babys breath but I have no idea how much I will need. We are using the larger variety of babys breath and need it for the following. Hi Karen! In total, I would recommend 24 bunches of baby’s breath for all of these arrangements. For the bridal bouquet, you should use 3/4 of a bunch. For the bridesmaid’s bouquet, you can use 1/2 bunch per bouquet. For each buttonhole, you can break apart 1-2 stems for all of them. For the small mason jars, you can use about 1/2 bunch per jar. You can use 2 total bunches for both spheres. The hearts wreaths will need about 4 bunches for all wreaths. Finally, for the small aisle arrangements, you can use 1/2 a bunch per arrangement. I hope this helps!! how many bunches do I need? Hi Lourdes! For a 7″x 7″ wall, you would need roughly 10-15 bunches for nice full coverage! I am using baby’s breath to fill mason jars for my wedding. I have 28 tables with a small mason jar and a large mason jar on each and am trying to determine how much baby breath to purchase. I have been looking at Sam’s Club who sells it in 5 or 10 bunches. Do you have any suggestion on how much to buy? So for a small mason jar I would recommend using 1 stems of baby’s breath broken down into smaller stems. For the large I would suggest about 3-4 stems broken down into smaller stems. For 28 large jar and small jars you’ll probably need about 130 stems of Baby’s Breath, considering it comes with 8-13 stems per bunch (let’s average 10 stems per bunch) so you would need about 13 bunches of baby’s breath. I have 12 – 24” Eiffel vases that will have baby’s breath shaped as a ball in top. How many stems/bunches do I need…and what size oasis bouquet holder do I need to order? 3” round? To make a baby’s breath ball for a 24″ tall vase I would recommend using 7-10 stems per ball (depending on how big you want it) so you’ll probably need to order about 8-10 bunches to do all 12 vases. A 3″ foam ball would be ideal for that size vase! Can you, please, help me out with how much of baby breath I need to order? I think you’ll need to order about 14 bunches of baby’s breath to do everything! We need to fill 16 planters that are 3.5 inches high and 6.5 inches wide and 6 pts that are 5.5 inches high and 5 inches wide. I was estimating 200 stems (2 bunches). Is that close? Also do you recommend oasis or will the stems be too brittle? Hi Denise! The 16 planters that are 3.5 inches high and 6.5 inches wide you will need about 1/2 a bunch per container. For the 6 planters that are 5.5 inches high and 5 inches wide, you will need about 3/4 a bunch per container. 200 stems will be plenty for your arrangements. If you want to add shape and structure the oasis foam would be great. You can stick the stems into the foam, they are certainly strong enough! I hope this helps!! Hi Sarah! I would recommend the following for these arrangements: For each bridesmaid’s bouquet, you can use about 3/4 of a bunch. For the three small bouquets, you can use about 1/2 bunch of baby’s breath. For the 7 groomsmen, you can use a small sprig and probably need only 2 stems total. For the centerpieces, you could use 1/2 a bunch for a nice full arrangement. In total, I’d suggest ordering roughly 12-13 total bunches needed. how much baby’s breath do you think I need? I’m needing baby’s breath for my daughter’s wedding. This is what we are using. Could you tell me how much I need to order please. Hello Tana! For the galvanized buckets, you would need roughly 1/2 a bunch per bucket. For the quart sized mason jars, I’d recommend 1/2 a bunch as well. For the boutonnieres, you would need about 4 stems to make all 10 boutonnieres. in total, I would recommend about 16 total bunches. Oh my goodness, this is so helpful! Thank you so much!!! Hi Kimi! We are glad that we could help! Thanks for the kind words! Hello, I’m looking to purchase baby’s breath for my wedding, and would need help figuring out quantity. Hi Laura! I would recommend that you would need in total roughly 18-20 total bunches of baby’s breath to complete all of these arrangements. For the boutonnieres, you would 1 sprig of baby’s breath per boutonniere. For the bridal bouquet, I’d suggest using 1 bunch of baby’s breath for a nice full arrangement. For each bridesmaid’s bouquet, I would suggest about 3/4 a bunch per bouquet. For the 10 mason jars, you can use about 1/2 a bunch per jar. Finally, for each bucket, I would suggest using 3/4 of a bunch as well per bucket. I hope this helps! Hi Ashley! I would suggest using about 1/2 a bunch of baby’s breath per mason jar for a nice full look. For the bridesmaid’s bouquets, if they only have baby’s breath should also use about 1/2 of a bunch per bouquet. For the bridal bouquet, I’d recommend about 3/4 a bunch to mix with the 2-3 roses. In total, you will need roughly 30-40 total bunches of baby’s breath. I hope this helps! I would love to make 2 garlands of baby’s breath for the aisle. I will only have 5 rows of chairs. how many steams of baby’s breath do you suggest I use to make these garlands? Hi Sam! To make two garlands, I would recommend roughly 10-14 bunches depending upon how full you want the garland to be. You can always purchase a wet foam garland and stick the baby’s breath directly into the foam to help keep it fresh and alive for the ceremony. I hope this helps! This thread is fantastic! I am looking to do 5 very full baby’s breath centerpieces, my vases are 6″ x 32″ My first question is, in order to get a full rounded look should I use floral foam (if so what size) or should I place the stems directly into the vase? Second, the same question everyone has; how much baby’s breath will these require? Hi! I have a couple questions I am hoping this thread can answer. I have 5 tall centerpieces standing at 6″ X 32″ I am looking to make very full rounded baby’s breath arrangements in these. Should I be using floral foam for this look, or placing the stems directly into the vase? About how many stems/bunches would a look like this require? Hello Sarah! Yes, you should use wet floral foam. Place the foam into the container. Cut the stems of baby’s breath to size and stick them through the foam. The foam will help to build the round shape that you are hoping to achieve. In total, I would recommend using 2 bunches per arrangement. In total, you would need roughly 10 bunches of baby’s breath. Thank you so much! This confirms I should be able to tackle the centerpieces myself cost effectively!! Thank you so much for the break down!!! It is so helpful! Hi Serena! Thanks for the very kind words! We are thrilled that you found this post helpful! Hi I was curious as to how much baby’s breath I would need in order to create a bride’s and bridesmaids bouquets fully out of baby’s breath. Thanks for the info! Hi Mary! For the bride’s bouquet, I would recommend 1 full bunch of baby’s breath. For the bridesmaid’s bouquet, I would suggest 3/4 of a bunch. I hope this helps! Hi! I will be getting married on May 2019. I just want to know how many bunches or stems of baby’s breath I will be needing to make up 5 bridesmaids bouquets, 2 small bouquets, 1 flower crown, 5 boutonnieres, and 6 mason jars? I really need help. Thanks! Hi Kristin! For the bridesmaid’s bouquet, I would suggest 3-4 of a bunch per bouquet. You can use 1/2 a bunch for the two small bouquets. For the flower crown, you can use about 2-3 stems. For the boutonnieres you will only need 1 sprig per piece, a total of about 1-2 stems will cover them all. For the mason jars, I would suggest 1/2 a bunch. In total, I would suggest ordering about 10 bunches of baby’s breath! Hope this helps! Next month, I will be hosting a baby shower for my daughter and I am planning to use empty 4oz. baby food jars (2-3/4″H) filled with floral water beads with a small sprig of baby’s breath. I would like the little vase to look delicate and sweet and will probably have about 30 little baby vases. Am I on target with one bunch of baby’s breath? Any advice would be greatly appreciated. Many thanks. Hi Patricia! I would suggest about 2 bunches. Each bunch comes with 7-10 stems per bunch. It is always a better idea to have more than run short. If you have any extra you can lay those around the table perhaps for another decorative touch. Hope this helps! My daughter is getting married this April. I will be doing 10 mason jar centerpieces using baby’s breath and daisies. We do not want really full centerpieces. I’m also doing 2 small bunches on the aisle entry tied to chairs with just baby’s breath. Would like some help in deciding do I need to order a box or just bunches and how many.